Make sure to check out all my other Free Crochet Squares too!! 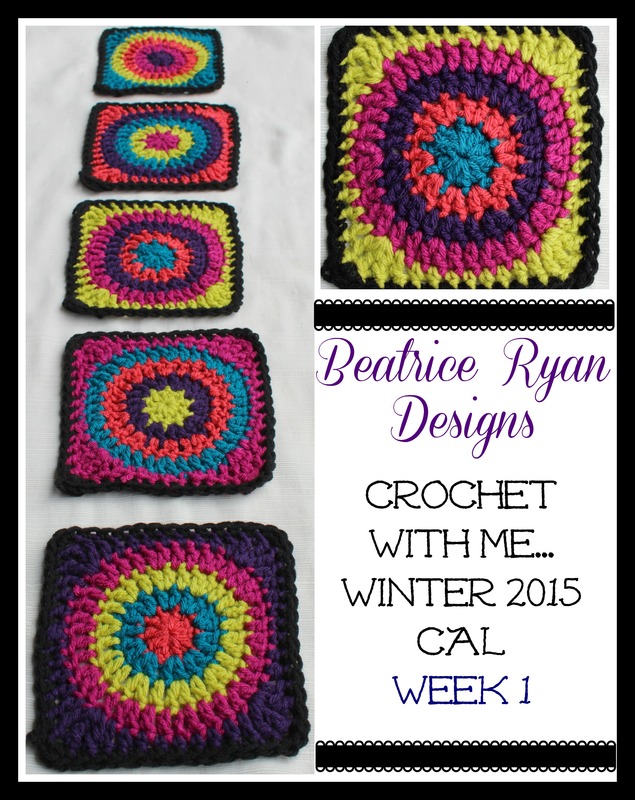 Beatrice Ryan Designs ~Crochet with Me… Winter CAL is now starting!! I am so excited to share with you the first part of our Crochet with Me.. CAL Afghan design!! You voted for a surprise design and this one will surely be that!!! I am really loving the way this Retro Style Afghan is coming along!! So,,, Let’s go over some of the details,,, Then~ Week 1 Instructions!! *Each Sunday I will post an assigned amount of crochet, hopefully just enough to keep you moving forward to complete our project in a timely manner,,, But not too much to discourage you from finishing!! *A Group Pinterest Page! You can post your progress pictures right to Beatrice Ryan Designs Crochet With Me CAL Pinterest Page… Just email me your request to [email protected] and I will send you an invite to join the page!! *You can join me on Instagram for occasional #SneakPeak of the upcoming week pics!!! Are you ready to get started?? Let’s get Crocheting!! Below are Week 1’s Progress pictures… What do you think?? Don’t worry,,, It isn’t a Granny Square Afghan,,, But it does have quite a few of them in the design… In a couple of weeks… You will see how this afghan design begins to unfold… I think you will be surprised and very happy with what we will be doing!! This week 1 progress picture of my first afghan is a Circle in Square using the traditional color changing technique. I used Loops and Threads Impeccable Yarn. It is soft and nice to work with and I loved the color results!! For the Second afghan, I used Red Heart Unforgettable in Polo,,, It is a self-striping yarn and is very soft! Less weaving in the ends and it has a more gradual color change… I love this one too!! Materials list ~ Click Here for last weeks post. Each Square should measure approx. 6″ x 6″. *If using Multiple Color Yarns and traditionally changing, You will change color each Row 1-5 and end with Row 6 using the Border Color. Row 6: Change to Border Color, Join to any Dtrc with Sl St, Ch 1, 3 Sc in the same St(this makes a corner), Sc in the next 11 Sts, *3 Sc in the next St, Sc in the next 11 Sts*, Repeat * * 2 more times. Join to beginning with Sl St. =56 Sc Finish off. Congratulations… You now have a Circle in a Square!! Make sure to complete 5 of these squares this week… Thank you for joining in the Fun!!!! And… please come share your pictures Wednesday on Facebook or on our group Pinterest Page!! Weekend WIP’s… CAL Show and Tell time!! How is your CAL coming along… Did you finish Week 1’s assignment?? 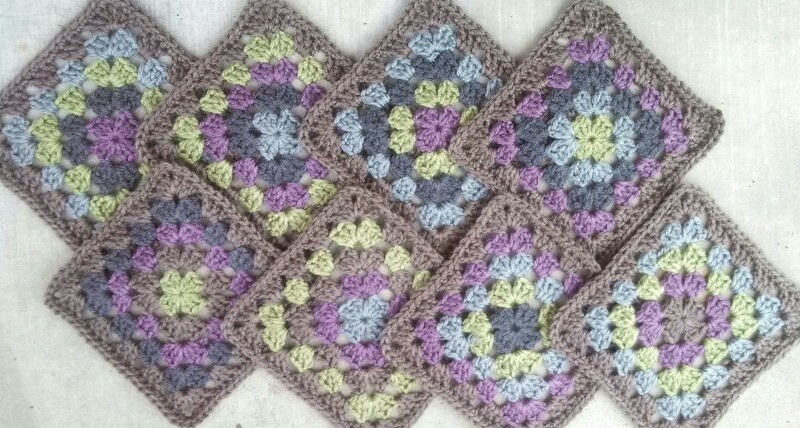 I can’t wait to see all the Granny Squares later today on our Facebook “Show and Tell“!!!! I have seen a few and I love your color choices…One of our friends chose her yarn from the inspiration of her beautiful Stained Glass Fireplace Screen… Another chose muted colors and I hear there is even a solid afghan in the mix!!!! So hop over to Facebook at 5 pm EST to show off your Granny Squares!! I will have a specific post titled “CAL Show and Tell” pinned to the top of my Facebook page… Just post your pictures there!!! If you dont have any pictures,,, you can just give us a shout out about your squares… And if you aren’t participating… Stop by to see what all our friends are doing!! Here are my squares… I know you have seen them before (they are the background of the blog too)… In the next few weeks this afghan will really start to show off its beauty… I hope you all are having fun! !